The Himmelsbrief was a type of letter or testament carried on a person or hung in the home for protection against evil people and deeds. These magickal papers were also known as Letters of Protection or Letters from Heaven. Hohman, author of the popular Pow-Wow book Long Lost Friend, is thought to have produced the first Letter from Heaven for use in the United States. The Pennsylvania Germans thought this paper was as powerful as any invocation or cast spell. In 1918, the Aurand Press out of Lancaster, Pennsylvania, received an order for printing copies of such a Letter of Protection. It was later learned that the copies were distributed to members of the National Guard and to draftees departing from several south-central Pennsylvania counties and heading for World War I. The Himmelsbrief came in a variety of forms, from a self-penned version to stuff in one’s pocket to more elaborate documents complete with hand-painted art and ornate borders, just like the German baptismal and marriage certificates. Some included Christian symbolism while others were more paganized versions with the magickal designs of stars, tulips, eagles, hearts, distelfinks, etc. Himmelsbrief Letter of Protection thought to be carried by George Washington. Pow-Wow research tells us that there were many written varieties of the Himmelsbrief — and therefore, changing the one given in this post to meet the needs of the person you are protecting will not harm your intent. Simply think carefully about your wording and what energies you would like to invoke. The one given here is much like that found in Mysteries and Secrets of Magick by C.J.S. Thompson, and to my knowledge, is copyright free. A Christianized version of this prayer was said to have been carried by King Charles I against danger and poison and claimed to be drafted by Pope Leo IX. Your prayer can be changed to fit your religious beliefs, matching deity to that which your ascribe. A list of Gods and Goddesses, Angels, or Saints can be added to the end of the prayer. In most cases, the Himmelsbrief is designed on standard size paper, and in these modern times, reduced mechanically to fit in a soldier’s pocket. According to Fogel, there were originally two types of Himmelsbrief’s — that used to get rid of a specific difficulty (much like the “tickets” of the West Virginia healers), and that which was invoked for warding and protection. The Himmelsbrief’s shown later in this article fall under the Christianized category as an example of what was available to the public as printed by local newspapers, and in books from the late 1800′s into the next century. The protection Himmelsbrief was carried by American soldiers in the Revolutionary War, Civil War, First and Second world wars, Korean Conflict, Viet Nam, Gulf and Iraq what-every-they-are-calling-them-these-days. 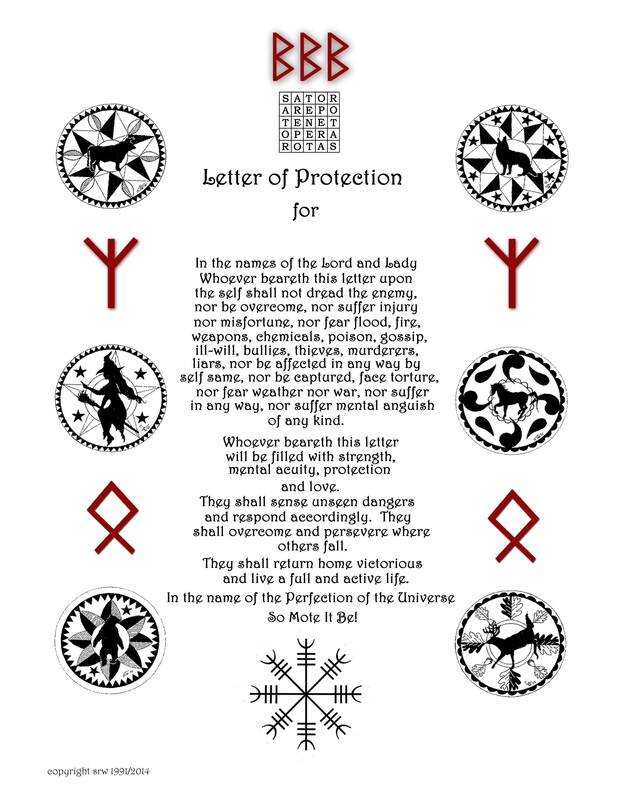 To make the prayer more powerful, the Pow-Wow would add a lock of his or her hair and a lock of hair of someone who truly loves the individual to be protected, such as mother, father, brother, husband, or wife. A child’s hair was not used. This circle of hair — from Pow-Wow to loved one to the recipient — was considered a powerful bond of protection. Others who have carried the Himmelsbrief include firefighters, police, emergency personnel, nurses, doctors, disaster volunteers, construction workers, travelers and truck drivers. Does it work? 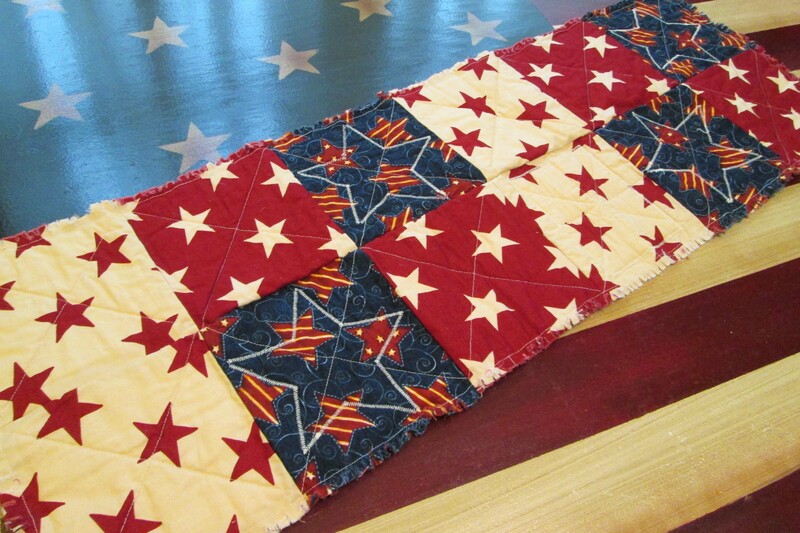 Before both our son and daughter left for Iraq during the war I had an Amish raised (yes, there are some) Pow-Wow make and empower a Himmelsbrief for both children. During my daughter’s tour in Iraq, her convoy was attacked. She survived. The camps of both my son and daughter were bombed — not a scratch. They are both home safely. I am profound believer in the Himmelsbrief! The previous post has a large version of the Himmelsbrief used by the Black Forest Clan and my students in general. Remember to add three equal-armed crosses drawn on the bottom of your paper. This is to seal the magick. This is just one way — there are several other ways to activate and empower the document. 1. Copy the Himmelsbrief and cut excess paper. 2. Fill in the name of the person who is to be protected on the corresponding line of the Himmelsbrief. Many folks shrink the Himmelsbrief these days to a very small size so that it can be laminated and fit in a soldier’s pocket. 3. Cleanse and consecrate paper with the four elements (earth, air, fire, and water) OR the four archangels. Add any additional symbols of your choice on the paper. If you have the facilities, you can copy a picture of your loved one and scan it on the back of the paper. 4. If you have not scanned the picture on to the paper, place the loved one’s picture on top of the paper. 5. Carry the paper and the picture to the four quarters, beginning with the north, and ask each quarter (or each angel) energy for divine protection for the person named on the paper. 6. Call down the your idea of Spirit and ask for blessings and protection for the individual listed on the paper. 7. Repeat the prayer on the paper three times, beginning with the person’s full name each time. 8. BLOW SOFTLY ON THE PAPER NINE TIMES — DO NOT SKIP THIS STEP. Hold your hands over the paper and picture, and allow protective energy from the divine to flow through your fingertips. Envision the paper and the picture filled with glaring white light. Hold this visualization as long as possible. 10. Draw an equal-armed cross on the picture to seal the work. 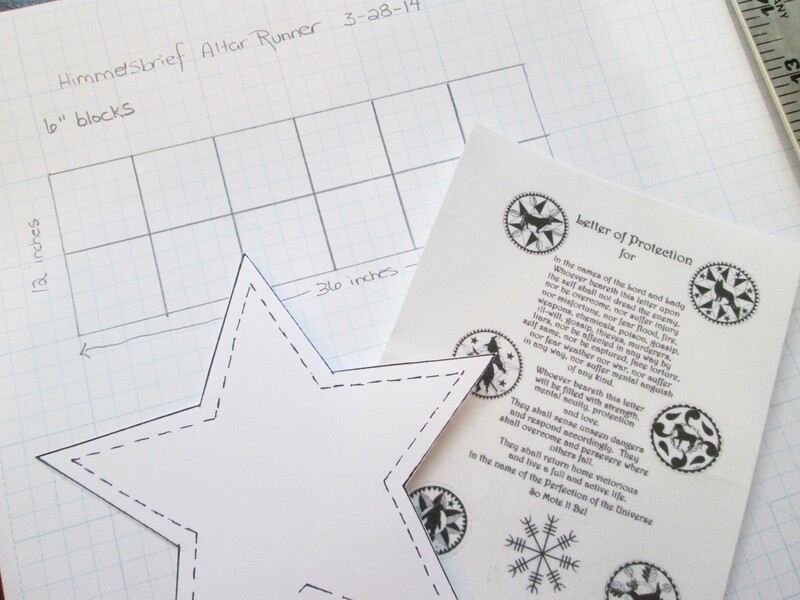 Draw three equal-armed crosses on the paper to seal the work. 11. Thank divinity. Thank the quarters (or angels). 12. Give the paper to your loved one and tell him or her to keep it on them at all times. Note: Burn a white candle every week to reinforce your prayers, especially during the time when the loved one is in harm’s way. Additional Instructions: Parents — Change step 9 to the following: The mother puts the paper on her chest. The father holds the mother, chest to chest with the paper between them. The parents breathe together in unison until their breath is synchronized for at least one full minute, visualizing the safety of the child. This visualization should be agreed upon before the procedure begins (very important). Finish by saying: I know you will do this for us. So mote it be. As a Side Note: This letter can also be given to someone who is suffering emotional, psychological, or physical abuse. However; no letter of protection should be used instead of proper medical or legal assistance. Over the years, newspapers in the South Central Pennsylvania area on occasion printed Himmelsbrief’s (Protection Letters) without the artwork for their readers enjoyment and interest. These letters were boxed (with a single or double border) so that they could be cut out of the newspaper and used by the reader. Where some PowWow practitioners believed the letter must be written in one’s own hand, others chose to use these pre-printed newspaper clippings. In the examples given here, notice that the wording differs slightly, yet the claim that the letter was found in Holstein in the year of our Lord 1724 remains the same. Example One — Home and Protection Letter — The opening of the actual letter in this example reads more like a sermon rather than a simple request for protection, and we can see that the author was of the fire and brimstone type as well as somewhat verbose attempting to sway the reader with his own belief on how one should behave so that the letter will work. In essence, he is telling you that the letter won’t work unless you believe the way he does. In this way, he is attempting to control the reader’s belief in magick and the divine. The actual letter of protection itself, falls after the admonitions as you shall see, and does not mention Christian moral no-no’s. “Just as Christ remained still at the Mount Olives, so shall guns be still! Whosoever hath this letter about him shall be safe from the enemy’s weapons of destruction. God will preserve him from robbers and murderers; it shall make him imperious to all deadly weapons that may be brought to bear upon him, by command of our most gracious master, Jesus Christ. God is with him who carries this heavenly letter in war and in peace; he will be protected from all danger — in the distress of the visitation of fire or water it shall protect him. Whosoever doubt the truth of this may attach a copy of the letter to the neck of a dog and then fire upon him, and he will be convinced of his truthfulness. Who hath this letter with him will not be captured by the enemy, nor wounded by his weapons. Amen! As surely as Christ has lived, died and ascended to heaven, as surely as He has wandered upon the earth, so surely shall it be impossible to shoot or stab the bearer; everything shall be free from molestation. I conjure all weapons in this world in the name of our Savior’s blood, that no bullet strike me, be it cast of gold, silver, iron or lead. God in heaven makes you secure from and free from all, in the name of God, the Father, the Son and the Holy Spirit! Amen! In the name of the Father, Son and Holy Ghost. I go forward in the strength of God. I go forward in the might of God. Who is powerful against every enemy, whether visible or invisible. God, the Son, is beside me. God, the Holy Ghost is above. in order that no one may cut or stab me. so all bullets shall be fired past. I conquer you from beneath. And I continually lead you. In the name of the Father, Son, and Holy Ghost. Example Two — May be a rewritten copy of the first example with more updated language. Notice, however, that the writer misunderstood, and forgot to put the actual charm, itself, at the bottom of the letter. Instead, the author assumes that the magickal letter is the body admonitions given by the first author. Notice too, that this author added the angel Michael, though he left the poor dog as a sacrificial proof in case the reader didn’t believe. In the name of God, the Father, the Son and the Holy Ghost: As Christ stopped at the Mount Olives, all guns shall stop. Whoever carries this letter with him he shall not be damaged through the enemy’s guns or weapons. God will give him strength that he may not fear robbers and murderers, nor guns, pistols, swords and muskets shall not hurt him through the command of the angel Michael, in the name of the Father, the Son and the Holy Ghost, God with me. Whoever carries letter with him he shall be protected against all danger; and he who does not believe in it may copy it and tie it tight to the neck of a dog and shoot at him and he will see that it is true. Whoever has this letter shall not be taken prisoner, nor wounded by the enemy. Amen. As true as it is that Jesus Christ died and ascended to Heaven and suffered on earth he shall not be shot, but shall stand unhurt, and adjure all guns and weapons on earth by the living God, the Father, the Son and the Holy Ghost. I pray in the name of Christ’s blood that no ball shall hit me, be it gold or silver, but that God in Heaven may deliver me of all sins in the name of the Father, the Son and the Holy Ghost. This letter fell from Heaven and was found in Holstein in 1724. It was written in golden letters and moved over the baptism of Madaginery, and when they tried to seize it, it disappeared until 1791, that everybody may copy and communicate it with the world. There was further written in it whosoever works on Sunday he shall be condemned. You shall not work on Sunday, but go to church and give the poor of your wealth; for you shall not be like the unreasoning animals. I command you six days you shall listen to the word of God. If you do not do so I will punish you with hard times, epidemics and war. I command you that you shall not work too late on Saturday. Be you rich or poor you shall pray for your sins that they may be forgiven. Do not swear by His name. Do not desire gold or silver. Do not fear the intrigues of men: sure as fast as I create you so fast I can crush you. Also, be not false with your tongue; respect father and mother; do not bear false testimony against your neighbors, and I will give you health and peace. But he who does not do so, or does not believe in this, shall be left by me and shall not have happiness or blessing. If you do not convert yourself you certainly will be punished at the day of judgment for what you cannot account for your sins. Whoever has this letter in his house lightning shall not strike it. All women who carry this letter with them shall bring forth living fruit. Keep my commandments which I send to you through my angel. In the name of Jesus. Amen. He that dwelleth in the secret place of the Most High shall abide under the shadow of the Almighty. I will say of the Lord, He is my refuge and my fortress: my God; in him will I trust. Surely he shall deliver thee from the snare of the fowler, and from the noisome pestilence. He shall cover thee with his feathers, and under his wings shalt thou trust: his truth shall be thy shield and buckler. Thou shalt not be afraid for the terror by night; nor for the arrow that flieth by day; nor for the pestilence that walketh in darkness; nor for the destruction that wasteth at noonday. A thousand shall fall at thy side, and ten thousand at they right hand; but it shall not come nigh thee. Only with thine eyes shalt thou behold and see the reward of the wicked. 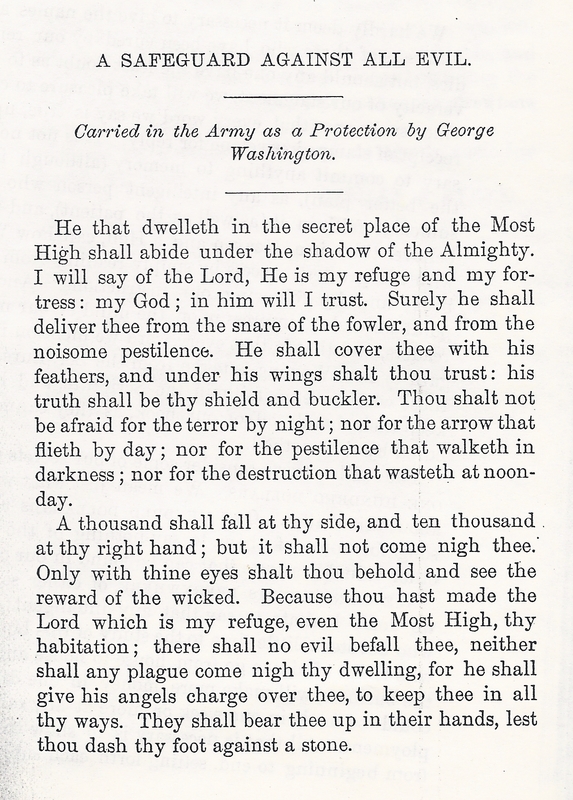 Because thou hast made the Lord which is my refuge, even the Most High, thy habitation; there shall no evil befall thee, neither shall any plague come nigh thy dwelling, for he shall give his angels charge over thee, to keep thee in all thy ways. They shall bear thee up in their hands, lest thou dash thy foot against a stone. Given that George Washington had a few close calls in his military career, I think I might choose this one over the other two. In all of the above examples, the words are to be written in a blessed place, and spoken aloud and forcefully three times. Other himmelsbriefs, such as those created to banish specific problems, are to be whispered, never spoken aloud. Peaceful sleep is something that many of us aspire to grab onto and take to bed with us, even in the 21st century! Insomnia, a horrendous goblin of the mind has plagued humankind throughout millennia. This charm, found on faded paper at the York Heritage & Trust, York, Pennsylvania, also appears in a somewhat different translation in Albertus Magnus Egyptian Secrets (4). Trotterhead I forbid thee my house and my premises. I forbid thee my bedstead, my couch. I forbid thee my horse and my stable that thou mayest not breathe upon me. Breathe into some other house until thou hast ascended every hill until thou has counted every fence post and until thou hast crossed every water and thy dear day may come again unto my house in the name of God the Father, the Son, and the Holy Ghost. Amen. Bedgoblin and all ye evil spirits, I forbid you my bedstead, my couch; I forbid you, in the name of God, my house and home; I forbid you, in the name of the Holy Trinity, my blood and flesh, my body and soul; I forbid you all the nail holes in my house and home, till you have traveled over every hillock, waded through every water, have counted all the leaflets of the trees, and counted all the starlets in the sky, until that beloved day arrives when the Mother of God will bring forth her second Son. In both examples, the spell is to be whispered three times prefaced by the plagued individual’s full name. The words of the spell, written on paper, are placed somewhere within the home (or office) where one feels that a trotterhead, bedgoblin, or evil spirit may be lurking. It may also be carried, pinned to the clothing with a safety pin. Unlike the Letters from Heaven given to soldiers & service personnel, the second type of Himmelsbrief , much like the “ticket”, was both given or sold for a nominal price. You have my complete permission to repost entire article anywhere you please with two conditions — please ensure that I receive credit for the article; and, in no way can anyone charge a monetary fee for the Black Forest Himmelsbrief or my instructions on how to bless it. Thank you. (1) http://www.archive.org — compilation and comparison of various Himmelsbriefs by Edwin M. Fogel, Ph.D. (see complete link above). (3) Guide To Health or Household Instructor, Ossman & Steel, Wiconsco, PA, 1894, page 1. (4) Albertus Magnus Egyptian Secrets or White and Black Art for Man and Beast — Revealing the Forbidden Knowledge and Mysteries of Ancient Philosophers, page 5. My copy has no author, no date, and no publisher listed, and was purchased in 1992. (5) Instructions based on interview with an Amish raised Pow-Wow, still living, whom we shall call J. B. (not the author of this piece). This week I’ve been working on blending material art and magick. 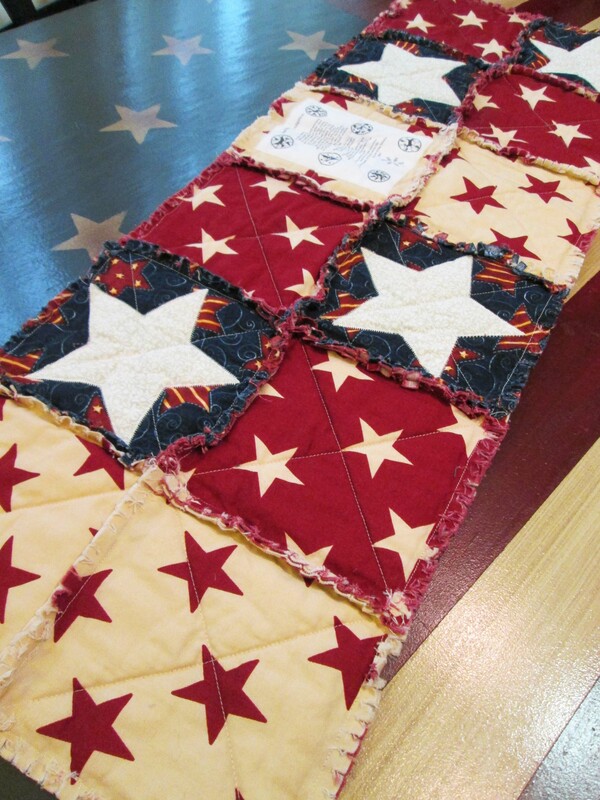 My daughter wanted me to make her a patriotic themed quilt to go with the decor of her home. 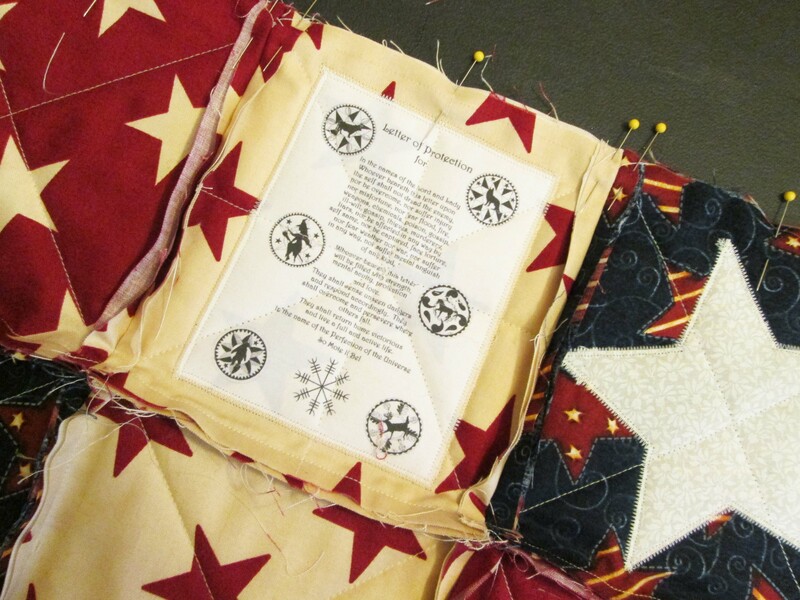 After finishing the quilt top I had plenty of material left over for other pursuits, which got me to thinking about the traditional Himmelsbrief (letter of protection). As today is a New Moon in Aries — this is the perfect time to empower a Himmelsbrief for a soldier, friend, family member who works under “fire” (such as a nurse, soldier, police person, EMT, doctor, fire fighter, or someone who works in a “dangerous” part of town). I’ve provided a copy of my Himmelsbrief (above), should you wish to use it. All I ask is that it not be sold as I have it here — although you can certainly put the Himmelsbrief in something that you wish to sell. For example, I whipped up this prim piggy, stuffed with protective herbs and a paper himmelsbrief. Primitive Patchwork Calico Piggy by Silver RavenWolf. Piggy contains Himmelsbrief, wintergreen leaf, Juniper Berries, Frankincense Resin, Whole Cloves and Lobelia Leaf. I’m also working on a rag altar runner, using the same material as well as a printed copy of the Himmelsbrief on cloth, which I turned into an applique. Rag Himmelsbrief altar runner in progress. An Aries New Moon is an excellent time to empower a Himmelsbrief, particularly done in the Mars hour. 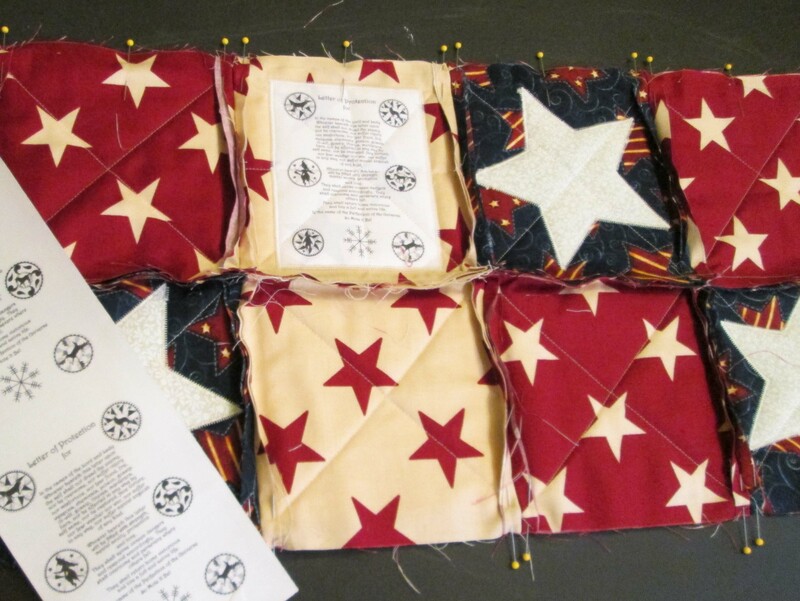 Completed Himmelsbrief altar runner with applique stars. It took me a day to create the runner because I spent so much time thinking about and working on the overall design. This altar runner not only fits into summer decor, it also can serve as a wonderful piece of inspiration when working magick for those you love who are involved in “service”. Don’t want anyone to know about the magick? Turn the runner over when not in use. The Aries Moon provides a wonderful backdrop for workings of self-discovery, independence, new insights, initiative, disengaging from something negative, banishing curses and protecting others with a Warrior Spirit. With the Sun exalted in Aries — success, speed, and force are at your fingertips. What work can you do today, using the Himmelsbrief, (or the Aries Moon) to enhance the lives of those you love?